Broccoli is good by itself...but why not add a double dose? 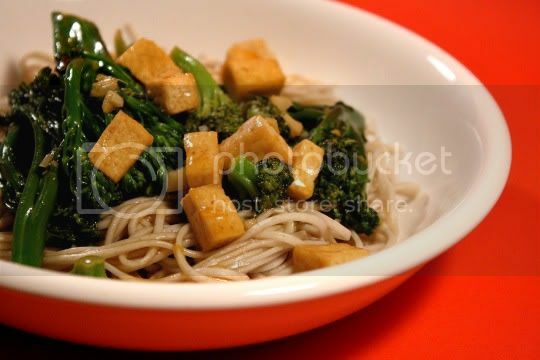 A delicious stir-fry of tofu, broccoli, and its more bitter cousin--broccolini--are set atop a bed of hearty soba noodles, then drizzled with a fragrant, sweet, and savory sauce. Orange juice (fresh-squeezed, of course) is the main sauce ingredient, although sugar, soy sauce, and a little cornstarch for thickening are added too. For some reason, the cornstarch never really thickened the sauce, so you might try adding a little more. Orange zest adds extra orange flavor, and pungent and spicy garlic and fresh ginger create an unmistakable Chinese flair. The broccoli is tender and mild, but the broccolini is tougher, chewier, peppery and pungent. It's really a great combination that showcases the two vegetables. In fact, the veg mixture is SO good that I'd suggest you HALVE the noodle amount and DOUBLE the stir-fry. You'll actually have a lot of sauce left over, so if you do double the mixture, you shouldn't have to double the sauce. But the broccolis should be the star in this dish, not the the noodles. Make again? Yes, with the revisions above. Thinly sliced red bell pepper would probably be a good addition for flavor and color.